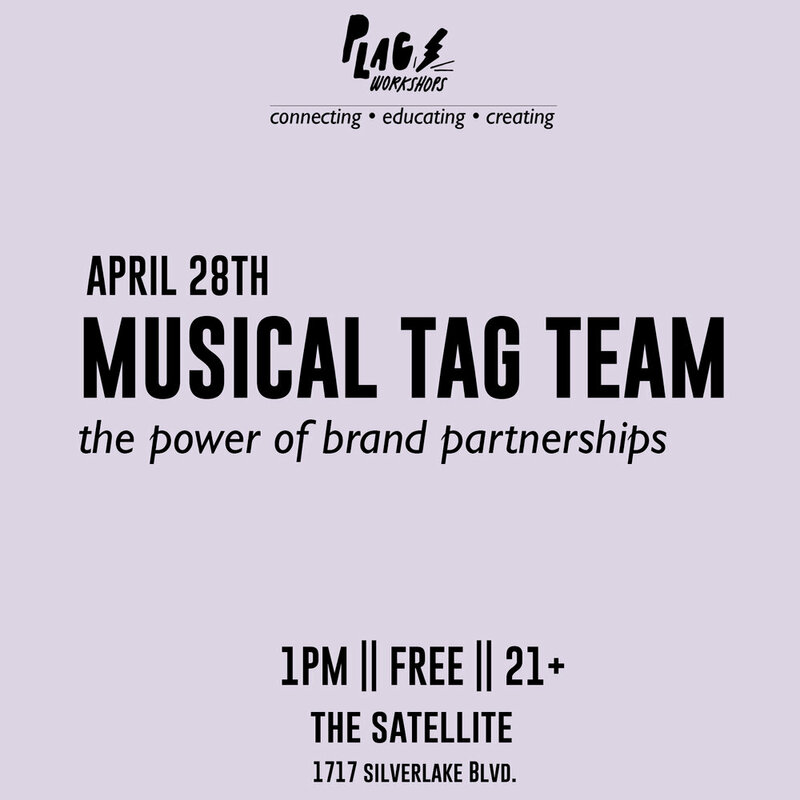 PLAG Workshops return on April 28th for a discussion of brand partnerships. What are brands looking for in artist partners? What do these deals look like? How can you approach brands you are interested in working with? We'll answer it all. We'll have a donation jar at the door if you would like to contribute. You can also donate on Venmo at @plagworkshops or Paypal at donate@plagpresents.com. We're a 501(c)(3) now so you can deduct it all on your taxes! Help us keep these workshops going. :: Alisann Blood is currently Senior Vice President, Brand Partnerships at Maverick where she leads marketing efforts and develop strategic partnerships for brands and the Maverick roster of artists, which includes Madonna, Paul McCartney, The Weeknd, Britney Spears and Miley Cyrus, among others. She has more than a decade of experience in the brand partnerships space most recently at Crush Music where she spearheaded opportunities with top global brands and Crush's roster of talent. Prior to Crush, she was Vice President of Brand Partnerships & Sync at Capitol Music Group and has held various integrated marketing roles at Steve Madden, ID-PR, Island Def Jam Music Group and Elektra Entertainment. Alisann graduated from the SI Newhouse School of Communications with a degree in Television/Radio/Film. :: Zoë Sonquist King is currently Senior Vice President, Brand Partnerships + Development at Paradigm Talent Agency, where she helps to identify new ways to create innovative partnerships between worldwide brands and Paradigm’s clients. The agency’s roster includes the likes of Lorde, Sia, Ed Sheeran, Coldplay, Imagine Dragons, Alessia Cara, and Zedd among others. Before joining Paradigm, her experience totals over a decade in partnerships, advertising, and synch at Warner Bros Records, Capitol Music Group, ad agencies and as one of the founders of the music networking group “Synch This.” While she studied political science at the University of California in Santa Barbara, her real music education began at her college job working the counter at Just Play Music – a local indie record shop. :: Marisol Segal is a brand marketing, content and industry relations specialist with 20 years of experience in music and technology. She has held leadership positions at a number of innovative companies including music streaming service, Rdio and global digital distributor, IODA. She currently serves as Brand Partnerships Lead for Sonos. :: Christy Willingham oversees consumer marketing partnerships and strategy for the Xperi family of technology brands, including audio pioneer DTS and HD Radio. With more than 12 years of experience in the music and entertainment marketing industries, she preaches the importance of developing compelling and authentic collaborations between creators and brands to drive impactful engagement with consumers. Over recent years, Christy has lead collaborations with artists including Imagine Dragons, One Republic, Young M.A, Reggie Watts, Hans Zimmer, The Jimmy Hendrix Estate, Jon Bellion, Deepak Chopra, Phantogram and Big Boi, among others. She has also spearheaded integrated marketing activations for film releases and gaming launches with studios such as Lionsgate, Universal, Warner Bros Interactive and Disney Interactive, and product launches with brands like VIZIO, Logitech, McIntosh, SteelSeries, Sound United and more. Prior to Xperi, Christy held various roles within Warner Music Group, starting as a college marketing rep for WEA in Louisville and followed by a move to the Marketing department out of the Warner Bros. Records’ ski lodge in Burbank. In her Marketing role, she handled end-to-end marketing programs and project managed album production and distribution for a slew of artists, including My Chemical Romance and Avenged Sevenfold, as well as composers including Tyler Bates and Atticus Ross. Christy is an LA native, holds a BSBA degree in Marketing from the University of Louisville and is a full time soccer hooligan.